Fred Faggionato is a French pen artisan who makes lacquer, acrylic, and acetate pens. Located in the south of France, in Saint-Maximin la Sainte-Baume, Faggionato follows “artisanal processes” to create his writing instruments. You can buy pens straight from the Faggionato website, but Papier-Plume, located in New Orleans, also sells the pens. 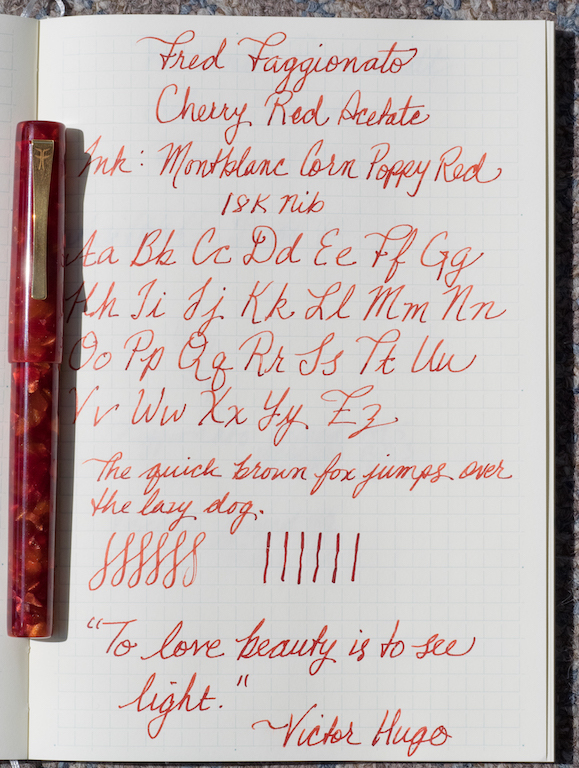 They loaned the Pen Addict a gorgeous model for review: The PKS Acetate in cherry red. PKS stands for Petrarch King Size, and this is the largest pen made by Faggionato. It is 144.3mm capped, 130.3mm uncapped, and 190mm posted. It is also rather wide in diameter, measuring 13.6mm. However, it is a light pen, weighing only 26 grams. The cherry red acetate is a gorgeous color with flakes of dark and light red throughout. It sparkles in sunlight. The pen has a flat top and bottom, and it is adorned only with a steel concave clip plated in gold with a matte finish. The Faggionato logo is engraved on the clip. The cap screws on to the barrel tightly, though occasionally I had to fiddle with it to get the threads to line up. This pen is a cartridge/converter filler. This particular model came with a medium #6 14k gold nib which is completely unadorned except for a breather hole and a stamp indicating the gold content. The feed is ebonite. The section is slightly curved but is only a little less wide than the barrel. Those who prefer wider grips will appreciate the girth of this pen, but those who prefer narrower grips may find this pen bit large. Faggionato offers other pen shapes and sizes in addition to the PKS. Even though the pen is large, I found it comfortable to write with. As I said, it is not a heavy pen, so it does not fatigue the hand. The medium nib is smooth. It is neither flexy nor bouncy, but it does have a slight amount of give, so I would not call it a “nail.” After about a page of writing, I noticed that the feed was going dry (you can see this where I was doing scrolls on the page). I had to open up the pen and push the ink down with the converter to get it going again. 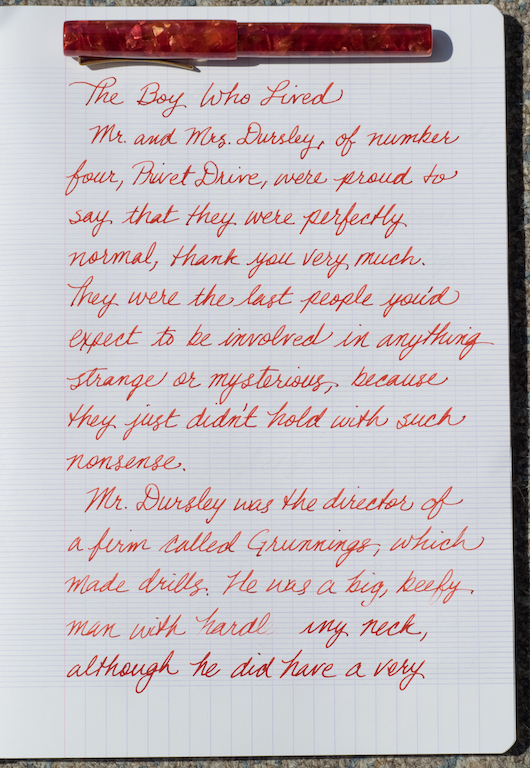 I also wrote a page from the first chapter of Harry Potter and the Sorcerer’s Stone in my Clairefontaine French-ruled notebook. Once again, near the bottom of the page the ink flow stopped and I rebooted it with a twist of the converter. I’ve have several converter fountain pens that exhibit this problem. I suppose it is an issue of air bubbles in the converter or, perhaps, the ink clinging to the plastic. It’s not a deal-breaker for me, but it is irritating, especially if you’re trying to take notes in a class and have to stop to get the ink flowing again. The PKS in cherry acetate is absolutely gorgeous material. Although the PKS is a large-sized pen, it is not heavy, so those who like oversized pens but prefer less weight will like this model. The 14k gold medium nib is smooth and has some give to it. The Faggionato clip is unique. I like the matte gold-plating, artsy curve, and unobtrusive logo. This particular model seems pretty expensive ($385) for a converter-filled pen. But these days, artisanal pens tend to range between $250 and $500, especially with gold nibs (I’m thinking of pen makers like Shawn Newton, Scriptorium, and Kanilea). The steel nibbed Faggionatos begin at the $200 range. My pen wrote inconsistently. I could get almost a page written with no problems, but then the ink would dry up. I’m not sure if this is a feed or converter problem (maybe both). Although I liked this Faggionato pen, it didn’t wow me like some of the pens by the makers listed above. That said, I was very impressed by his lacquer pens. But those are priced $650 and above. Posted on September 15, 2017 by Susan Pigott and filed under Faggionato, Fountain Pens, Pen Reviews.